Although it can also be found naturally in water, WVWD monitors and treats for perchlorate. It is a remnant of past manufacturing and agricultural operations in our area. The District monitors for perchlorate within the treatment system and as the water exits the treatment facility. Perchlorate is currently removed by three Ion Exchange Plants to treat Wells 16, 17, 18A, and 42, which are sampled weekly. Our new, state-of-the-art Groundwater Wellhead Treatment system also removes perchlorate from District Well No. 11 and Rialto Well No. 6, which analyzes perchlorate levels every thirty minutes using an Ion Chromatography instrument. Contaminants are measured in micrograms per liter (μg/L) or milligrams per liter (mg/L). One microgram per liter, (μg/L) is equivalent to one part per billion. To help put these numbers in context, one part per billion is like 1 second in 31.7 years, 1 teaspoon in 1.3 million gallons, and 1 drop in 13,563 gallons. One milligram per liter (mg/L), is equivalent to one part per million. One part per million is like 1 second in 11.6 days, 1 teaspoon in 1,302 gallons, or 1 drop in 13.6 gallons. In addition to maintaining high standards for our existing water supplies, we are also looking at innovative ways to bring new sources forward to help boost our supplies during the drought and for our future. Besides our new Groundwater Wellhead Treatment System which made previously inactive wells usable again, the District is currently moving forward with another project to remove perchlorate, nitrate, and trichloroethylene to further enhance production of those wells (WVWD Well No. 11 and Rialto Well No. 6). This water will also be treated and subject to rigorous testing, as all other water supplies, before it enters the drinking water system. Because we value transparency, we hope that you find this report clear and easy to understand. If you have any questions about this report, feel free to contact Robin Glenney, Water Quality Supervisor at (909) 875 1804, extension 371 or via email at rglenney@wvwd.org. West Valley Water District (District) is a Special District governed by a five-member Board of Directors providing retail water to approximately 82,000 customers. The District serves drinking water to portions of Rialto, Colton, Fontana, Bloomington, and portions of the unincorporated area of San Bernardino County, and a portion of the city of Jurupa Valley in Riverside County. Our mission is to provide a reliable, safe drinking water supply to meet our customers’ present and future needs at a reasonable cost and to promote water-use efficiency and conservation. Our source of water comes from groundwater wells that pump from the Lytle, Rialto, Bunkerhill and North Riverside aquifers. We also treat surface water from Lytle Creek in the San Bernardino Mountains, and California State Project Water - Lake Silverwood. Your District routinely tests for contaminants from these sources in accordance with Federal and State Regulations. The District vigilantly safeguards its water supplies. District staff collects samples on a weekly, monthly, quarterly, annual and triennial basis in accordance with U.S. Environmental Protection Agency and State Water Resources Control Board – Division of Drinking Water (DDW) regulations. The District operates and maintains several treatment plants to ensure we deliver the best water to our consumers; the Oliver P. Roemer Water Filtration Facility treats surface water from Lytle Creek and State Project Water delivered through Lake Silverwood; the Arsenic removal treatment plant treats water from Well No. 2; several Ion Exchange Treatment Systems treat water to remove Perchlorate from Well Nos. 16, 17, 18A, and 42. Our newest treatment facility, the Groundwater Wellhead Treatment System, removes perchlorate from District Well No. 11 and Rialto Well No. 6. This facility is the first in the nation to use bioremediation to remove perchlorate and distribute water directly to customers. In addition, the District and Carollo Engineers are embarking on another perchlorate treatment removal project using Fixed Bed Biological Reactors (FXB) to remove perchlorate, nitrate, and trichloroethylene. Construction of the FXB system began in summer 2016 and the facility scheduled to go online in calendar year 2018. 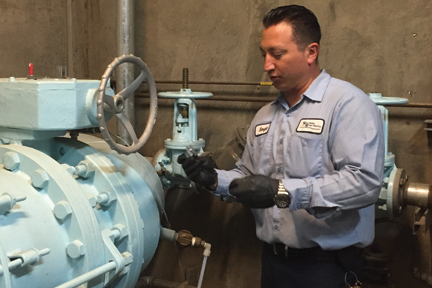 West Valley Water District serves approximately 82,000 customers in the communities of Bloomington, Colton, Fontana, Rialto, parts of unincorporated areas in San Bernardino, and a portion of Jurupa Valley in Riverside County. West Valley Water District is composed of three water sources: groundwater, surface water and imported water. The District receives approximately 13% of our total water supply from Lytle Creek in the San Bernardino Mountains, and is treated through our Oliver P. Roemer Water Filtration Facility. The water goes through several treatment processes and disinfection prior to delivery. The District purchases water from the Baseline Feeder Project through San Bernardino Valley Municipal Water District. This water comes from water pumped to Rialto from wells in San Bernardino, which makes up approximately 24% of our total water supply. The District also purchases approximately 17% of our total water supply from the State Water Project through San Bernardino Valley Municipal Water District. Also treated through our Oliver P. Roemer Water Filtration Facility. Our water quality staff collects samples on a weekly, monthly, quarterly, annual and triennial basis using EPA and State Water Resources Control Board – Division of Drinking Water (DDW) regulations. We test for over 80 contaminants to ensure strict standards of water quality. West Valley Water District vigilantly safeguards its water supplies. Our water meets all Federal and State Regulations. We are proud that the District always meets, and exceeds, these standards. The Groundwater Wellhead Treatment System, a new, first-in-the-nation project, using ground-breaking, cost-effective technology called bioremediation, was approved to remove perchlorate from drinking water supplies. The Groundwater Wellhead Treatment System utilizes Fluidized Bed Biological Reactors (FBRs) to remove perchlorate and nitrate from District Well No. 11 and Rialto Well No. 6. This treatment facility using FBR technology began delivering clean water to our customers in September 2016. The next treatment system that is currently under construction uses Fixed Bed Reactors (FXBs) for perchlorate, nitrate, and trichloroethylene removal. The FXB technology began construction in summer 2016 and will start delivering clean water to our customers in 2018. The Arsenic removal treatment plant treats water from Well No. 2. Several Ion Exchange Treatment Systems remove perchlorate from Well Nos. 16, 17, 18A, and 42. Inorganic contaminants, such as salts and metals, that can be naturally-occurring or result/ram urban storm water runoff, industrial or domestic wastewater discharges, oil and gas production, mining, or farming. In order to ensure that tap water is safe to drink, the US. Environmental Protection Agency (USEPA) and the State Water Resources Control Board (State Board) prescribe regulations that limit the amount of certain contaminants in water provided by public water systems. State Board regulations also establish limits for contaminants in bottled water that provide the same protection for public health. To view completed source water assessments, you may visit our District office located at: 855 W Base Line, Rialto, California, 92376 or call (909) 875-1804. You may also call the USEPA’s Safe Drinking Water Hotline to discuss local drinking water quality, drinking water standards, contaminants, and potential health effects at 1-800-426-4791. To protect public health, the US Environmental Protection Agency and the State Water Resource Control Board (DDW) will commonly use the following definitions to standardize water quality information. Maximum Contaminant Level (MCL): The highest level of a contaminant that is allowed in drinking water. Primary MCLs are set as close to the PHGs (or MCLGs) as is economically and technologically feasible. Secondary MCL’s are set to protect the odor, taste and appearance of drinking water. Public Health Goal or PHG: The level of a contaminant in drinking water below, which there is no known or expected risk to health. PHG’s are set by the California Environmental Protection Agency. Milligrams per Liter (mg/L): Or part per million (ppm) corresponds to one minute in two years. Micrograms per Liter (ug/L): Or parts per billion (ppb) corresponds to one minute in 2000 years. The District has listed the following as a health risk informational guide only. Health risk assessments are based upon exceeding a Maximum Contaminant Level (MCL). The State Board allows us to monitor for some contaminants less than once per year because the concentrations of these contaminants do not change frequently. Some of our data, though representative, are more than one year old. Nitrate is routinely sampled within District wells annually. None of these routine nitrate samples exceeded the MCL. Perchlorate was detected in five (5) groundwater source. All of these sources have treatment systems installed for Perchlorate removal. Perchlorate has been detected at low levels in six (6) groundwater wells (Nos. 11, 16, 17, 18A, 41, 42). Five of these wells are primary water sources and have treatment systems installed. It is believed that the likely sources for Perchlorate originate from former manufactures of rocket fuel/fireworks and fertilizer. (Well Nos. 11, 16, 17, 18A & 42 now have Ion Exchange Systems installed for Perchlorate removal). Completed Source Water Assessments may be viewed at the District Office located at: 855 West Base Line, Rialto, California 92376. Some people may be more vulnerable to contaminants in drinking water than the general population. Immuno-compromised persons such as people with cancer undergoing chemotherapy, people who have undergone organ transplants, people with HIV/AIDS or other immune system disorders, some elderly, and infants can be particularly at risk from infections. These people should seek advice about drinking water from their health care providers. USEPA/Centers for Disease Control (CDC) guidelines on appropriate means to lessen the risk of infection by Cryptosporidium and other microbial contaminants are available from the Safe Drinking Water Hotline (1-800-426-4791). Our newest treatment facility, The Groundwater Wellhead Treatment System, utilizes Fluidized Bed Biological Reactors (FBR) to remove perchlorate from District Well No. 11 and Rialto Well No. 6. This facility is the first in the nation to use bioremediation to remove perchlorate and distribute water directly to customers. The next treatment system that is currently under construction uses Fixed Bed Reactors (FXBs) for perchlorate, nitrate, and trichloroethylene removal. The FXB technology began construction in summer 2016 and will start delivering clean water to our customers in 2018. California received record rainfall this past winter, but it’s critical for West Valley Water District (WVWD) customers to keep embracing conservation as a way of life and focus on using water efficiently. Despite a wet winter that helped to boost water supplies, particularly in Northern California, our water supply comes from groundwater basins which take longer to recover. If you haven’t already made changes, WVWD offers many resources that promote water-use efficiency. For example, qualified homeowners can take advantage of the WECAN Turf Replacement Program funded by the Water-Energy Grant Program for the Water-Energy Community Action Network (WECAN) and WVWD. This program fully funds turf removal and drought tolerant landscape replacement projects between 750 and 1000 square feet at no cost to our customers. Income and geographic location requirements may apply, to find out if you qualify, please call (888) 899-8723 or send an email to WECAN@sawpa.org. For more information about how you can make conservation a way of life and more details on all WVWD rebate programs, please visit us online at WVWD.org/conservation. We also work with local elementary schools to create an annual calendar featuring student artwork with a water conservation theme. The 2018 calendar winners were announced and student and teacher prizes were distributed in June 2017. The West Valley Water District has a number of rebate programs to help customers save on their water bills. Below is a summary of the number of rebates awarded to date between July 1, 2016 and June 30, 2017. To find out more about ways to save water and access rebate programs please click here.